You had crooked teeth growing up and chipped one of the ones in the front as a teenager during a dramatic play in a softball game – now that more than a decade has passed, you’re more than ready to have your smile corrected. You’re considering porcelain veneers in Bonita Springs, FL, but you have some questions, including how white your new teeth will remain after you have them done. After all, you love blueberries, you enjoy your fair share of coffee, and you have a glass or two of red wine now and then. Discoloration to your new teeth is a big concern for you, but luckily, the team at Pelican Landing Dental can set you and your smile straight when it comes to what porcelain veneers are, why they’re used, and how resilient they can be. Veneers are a 100% customized way for Dr. Rich Gilbert, Dr. Lacy Gilbert, and Dr. Genevieve Garris to correct many common cosmetic dental problems. Since techniques like traditional orthodontics or teeth whitening can’t correct every fault in a person’s smile, these are a fantastic treatment option. You’ll work with our team to discuss the issues with your smile you want to correct and the final result you’re aiming for. Veneers are thin, yet strong shells of porcelain that are permanently affixed to the front side of your teeth. Your original dentitions will first be prepared by the dentist, and then the veneers will be permanently bonded to them. These are durable, long-lasting, and look natural – ensuring an aesthetically pleasing result. People of all ages can benefit from porcelain veneers and you can check out one personal success story here. Staining – For patients affected by severe stains from foods and beverages, or the use of tetracycline antibiotics, veneers are an excellent option. You’ll be able to choose the color of both the porcelain itself and the bonding agent to make sure your teeth are the shade of white you want. Chipped, Cracked, Or Short Teeth – If you’re dealing with chips, cracks, or teeth that are misshapen or that have lost length because of bruxism (grinding), veneers are a great way to correct a smile that may be a little rough around the edges. 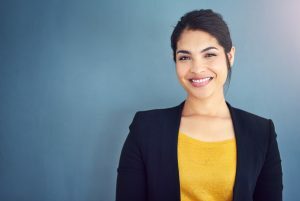 Alignment Issues – From gaps to rotation to bite issues, veneers can make your smile straight without braces. And, since this is a long-lasting solution, you’ll never have to worry about a retainer either. Are Porcelain Veneers Long-Lasting & Durable? Hearing the word ‘porcelain’ may inadvertently make a patient think the material used to upgrade their teeth may not hold up to everyday wear and tear. This is a complete myth – porcelain, in addition to being biocompatible, is remarkably durable. Patients can expect their veneers to last up to 20 years. You’ll also be able to speak and chew as you normally would. You can enjoy all of your favorite foods – from chewy caramels to crunchy carrots, you can maintain a well-balanced diet. And, you’ll be able to indulge in beverages like sports drinks, tea, coffee, and red wine – since the porcelain is stain resistant, you’ll never need teeth whitening with veneers. Now that you know how great of a solution porcelain veneers are, schedule your appointment to upgrade your smile with Pelican Landing Dental, the premier cosmetic dentist in Bonita Springs, FL today.